The aim of this how-to/tutorial is to enable anyone with basic soldering skills to adapt old Sigma lenses to work with new (digital) Canon bodies. Jiri Otisk has made a better version of this conversion chip and can be found here. I strongly recommend you use his version as it is much better designed and less buggy than the original one form the germand forum described in this article. Nobody bot you is responsible apbout whatever you might do. The procedure described here comes with no warranty. It has however been working for many people. All the credit for what is described below goes to the members of DSLR-Forum.de, especially Slein & Nightshot. The original post can be found here. My role in this project has been to gather all the info found on the forum thread and write this how-to. Since I do not speak German, some of the credit must also go to Google Translate. All the items needed to perform this mod have been purchased from eBay. You can however purchase them wherever you like. Before you start, make sure you have all the components and tools you need. An AVR programmer (I used an usbasp, which can be found en ebay). The code for the microcontroller. There are three versions, which can be found on the three original posts(v1, v2, or v3) and mirrored by Altomcat here (link to his blog here) and here. Note: I personally used v3 first and it works all-right. With v3, it crashes sometimes and randomly when taking a single shot (camera on/off required) and when taking two pictures within a second or so. After experimenting, I eventually chose v2 which crashes the camera sometimes but allows me to take bursts. A 100nF ceramic capacitor (with 104 written on it, to be precise) between Pin 1 (VCC) and Pin 14 (GND) of the ATTiny24. Since ceramic capacitors are not polarised, the capacitor can be connected in any direction as long as one leg of the capacitor is on the VCC and the other is on GND you’re good! This is a protection for the power supply of the ATTiny24. 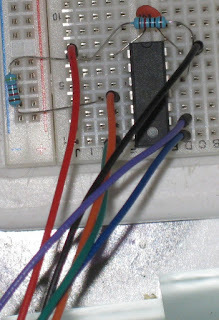 A 10k resistor between the Pin 1 (VCC) and Pin 12 of the ATTiny24. This is a ‘pullup resistor’: since the pin 12 is the input (signal coming from the camera) of the ATTiny24, the resistor will automatically ‘pull’ the voltage on Pin 12 ‘up’ if it is not brought down to GND by the camera. This sets the value on Pin 12 to ‘up’ by default. Resistor can be connected in any direction. A 47k resistor between the Pin 1 (VCC) and Pin 4 (Reset) of the ATTiny24. This is to make sure the processor does not reset randomly by keeping the Reset pin up. Resistor can be connected in any direction. Note: you may need to replace the “usbasp” by the programmer if you are using another one. More info on avrdude (syntax) here. This section describes how to open a Sigma 70-210 2.8 APO (for Canon). The procedure should however be similar for other lenses. Caution: DO NOT START opening the lens without the appropriate screw driver, this will damage the screws. 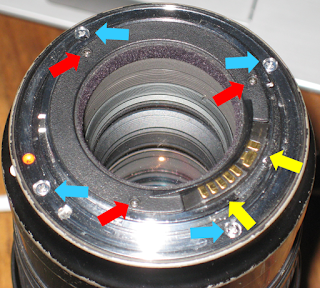 Finally, the four lens mount screws can finally be removed (blue arrows). Note: that this last step is optional but will make things much easier. 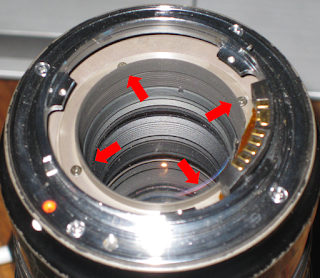 This is the final step: remove the four screws holding the metallic cover protecting the lens’ electronics (red arrows). 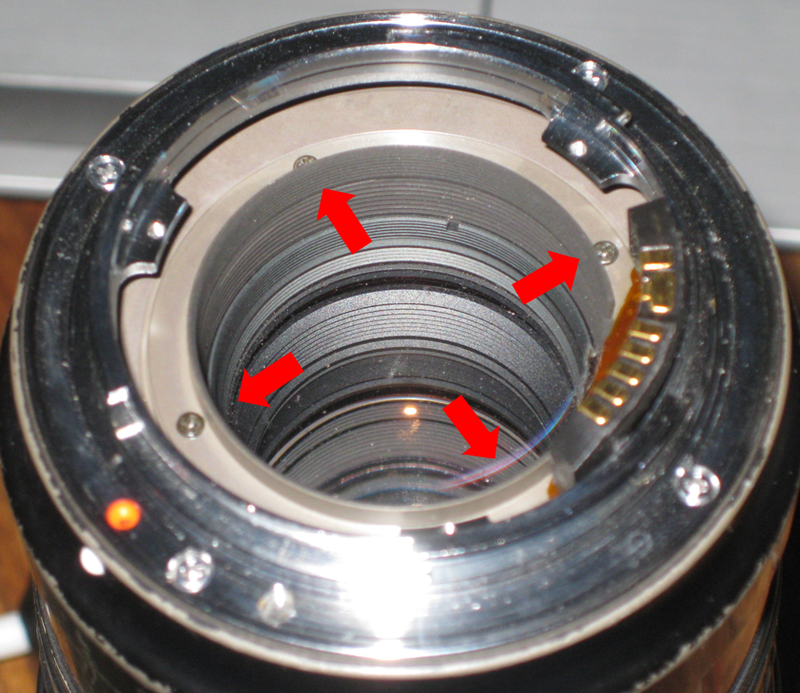 The next picture shows the lens open where the connector and PCB are accessible. For those of you who like to work with professional diagrams, Altomcat made a nice one here. Note: pin 8 should not be connected to GND when programming the ATTiny24 (or it won't work). Taking a burst of photos. That's it, have fun with your re-chipped lens! JV: It involves soldering near the rear lens element, so I protected the rear element from solder splash with adhesive backed copper tape (being careful to not actually contact the glass). I assume a couple of layers of Aluminium foil and some masking tape would do the job too. JV: The only suitable cable I had to hand was multi-core data cable wire, which is a pain to solder as it's stainless steel and doesn't wet well. An expert advised me to flux and pre-solder the stripped ends and the target contacts before making the final solder bond. This makes sure the solder at least penetrates the strands and gives some mechanical keying adhesion. JV: Soldering the wires to the EOS connector before connecting them to the chip seemed easiest to me. JV: There's fragile looking gears and belts visible inside the APO tele lens so to avoid the chip or wires fouling on them I wrapped the chip in electrical tape and secured the it to the inside of the lens casing using a solid block of 1mm thick double sided adhesive tape, a bit like a bug with it's legs in the air. It's secure but can be prised off if needed. JV: Before commiting to a test with my DSLR I tried the lens on an old film body first. I figured if I'd made a mistake that was bad enough to damage a camera then I'd rather it wasn't my DSLR, and old film bodies are cheap on eBay. It doesn't actually say WHY this is needed or what the problem is/was. However I assume it was the fact that you can't change the Aperture and get an error on modern cameras. Most lenses that suffer from this can still be used wide open in AP mode, however this fix greatly enhances the value and utility of these old lenses! I myself have an F2.8 24mm Sigma I will be doing this to. The solution indeed solves the aperture issue with older Sigma lenses. Older lenses indeed do not recognise the command issued by the DSLR and therefore only work wide open. Any chance you would sell pre-programmed chips for those of us better with screwdrivers than DLL's? First of all, there are three firmware version and none of them are perfect (see the reported crashes above). Some may work better in some configuration than others (lens/camera). Programming is really easy. All you need is a cheap avr programmer (look for usbasp on ebay), two resistors and a small cap. Finally, I did not make that small program I'm loading on the ATTiny24 and do not want to take credit for it. I posted this, because I feel the info should be available to everyone. Hi, I used a ATTINY24A-PU (which you can find on ebay). They run at 20mhz and I went for a DIP version of the controller simply because they are easier to solder & had plenty of room in the lens. I do not know much about electronics, but I can solder (just). The schematics are quite difficult for me, though. My lens (24/2.8) does not have much space, so I was planning to solder the connections directly to the ATTiny. Is the DCL in / out connection the only "man in the middle" connection where I must cut the connection between the camera and the lens and divert it through the ATTiny? Is GND soldered parallel to the P-GND connector, LCLK in parallel to LCLK and VCC parallel to VDD? Hi and thank you for your excellent blog. I have poor knowledge in electronics, but I was planning to fix the aperture problem on my 24/2.8 Sigma anyway. 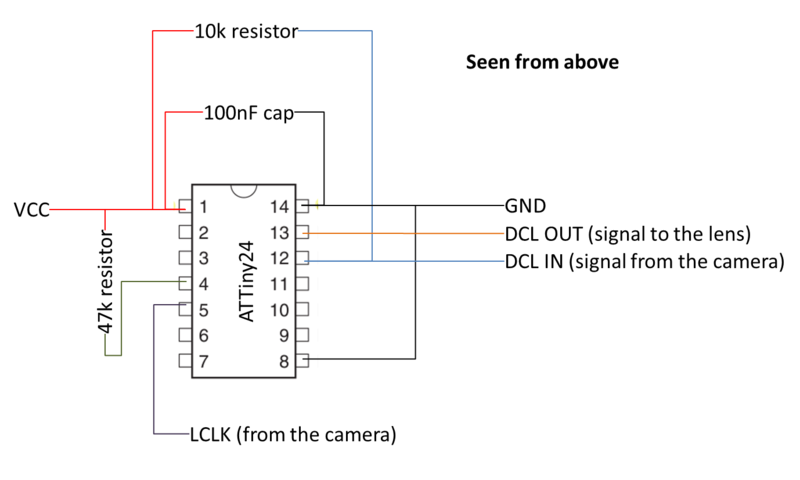 Could you please clarify the schematics a bit: Is the DCL in/out connection the only "man in the middle" connection, which must be rerouted through the ATTiny module (camera DCL->ATTiny->Lens DCL) and all other connections are parallel connections to the existing circuitry? (VCC->VDD, LCLK->LCLK, GND->P-GND). 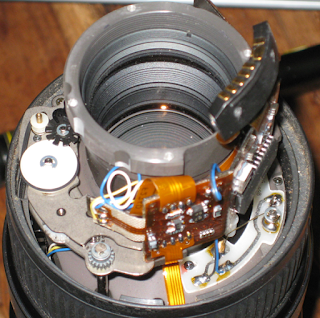 I do not have much space inside the lens, so cannot use a board but must solder directly to the module pins. Do I read correctly: one end of both resistors and capacitor go to pin1, which is connected parallel to VDD pin? about the DCL part this is the only place where the connection needs to pass through the ATTiny: DCL->ATTiny->Lens DCL. All the other ones are in parallel. Just like you I have connected all components directly to the attiny and used hot glue to insulate and protect the contacts. You are also correct saying that one end of both resistors and capacitor go to pin1, which is connected parallel to VDD pin (for convenience I personally connected VCC and GND somewhere else on the PCB of the lens). Hi and thank you for your response. The LCLK (from the camera) part confused me a bit. But must correct my own statement a bit: GND has to be connected to D-GND pin, not P-GND. Many of the pictures in the german dslr forum seem to be down as well, but with your instructions, the conversion should be possible. very interresting, while Sigma support is saying my 28/300 is to old for update ... It seems to be very simple and cheap ! Thanks, although the solution came from Nightshot & Slein, I only made the writeup... The solution is not perfect neither (see above) but can still be a cheap alternative to buying expensive lenses. Can you please upload the V1,V2,V3 firmwares somewhere else?? The http://www.dslr-forum.de/ is not allowing to sign-in and subsequent download. Please help. I'm in the same position now - cannot download attachments from the board. Could you upload them somewhere? Help needed and much appreciated! Than you. It was an awesome post. I did it atlast. Ordered 3 pieces samples from Almel. 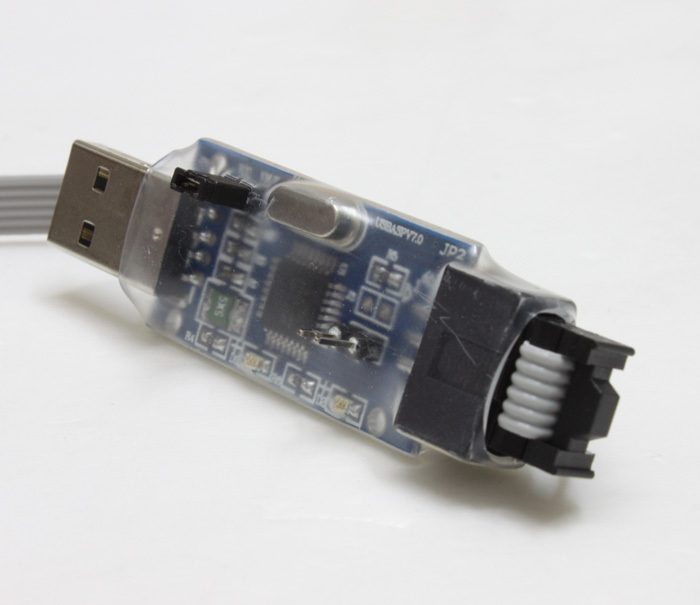 Used ABLab USB AVR programmer (7$). First tried version-3. It did not worked (May be hardware issue). Burned one chip (locked, may be will be OK by High voltage Programmer), then tried V2 with proper fuse bits. It was bit painful to cut and isolate the track 4 (DCL), but did. I opened the lens three times! And atlast, voila. Its working with all aperture settings, and did not crash till now. Thanks man! I'm happy you made it :-) I got about the same experience as you did and had to open the lens at least 6 or 7 times to get everything right. On the original forum post, it was not obvious that pin 8 of the micro-controller was supposed to be connected to the ground. I'm happy you did not get any crash so far, this is a good news (I'm using the v2 as well). Which lens did you modify? I am also using V2. Trying to collect another one for my friend and will try V1 and V3. Infact this time also I tried V3, but the chip was not recognized after that by programmer and I though Its gone.Hence programmed another chip by V2 (as you reported running) and burnt. Shall update the info for my 2nd version. I chipped my Sigma 300 F4 APO TeleMacro today. I used an MX-USBISP-V3.00 Programmer for about 9€ from eBay. My programmer only works with "ProgISP" a nice free Software. Use the ATtiny with the correct Fuses!!! CKDIV8 must be UNPROGRAMMED!! (on the ATtiny24) (i am 3 days failed because). i think, other Lenses use the same. Thanks for the extra details, it's true I've been a little quick on the fuses. I hope you're comment will help many others ! Hi, Just picking up the parts online, but cannot find the v2 firmware? Can someone post a file or send me a copy? Brian, read the post carefully. Mart has already given the link. The firmware links, as already metioned in the comments above, do not connect to valid downloads (one set of links are down and the DSLR forum ones do not contain the downloads. Thats why I have asked if anyone else already has the firmware and could reshare it. You did not read the post carefully. Follow the words, colors, hyperlinks and the very word "here". Thanks for your quick answer Chandan, I indeed made a mirror because the files were had to come by. I think I get the most of the fix. But where is the conections in the lens? how do I locate DCL in/out VCC, and LCLK ? Do anyone have a picture or can explain where to cut in the connections from the chip ? To cut the wire, I did cut the wire of FPC cable by scratching through a knife. Alternatively you may cut from main connector also (but it may be bit tough). Excellent summary. However, could you please clarify the connections to the chip, as there appear to be some differences between your layout and Altomcat's that I don't understand. This may well be my mis-interpretation as I have no experience of this sort of thing! Your diagrams above shows pin 8 connected to GND in the lens and warns about not connecting pin 9 to GND while programming the ATTiny chip, however you also list Pin 9 as already connected to SCK during programming. Is this Pin 9 GND warning a typo error and means a different ATTiny pin, or Pin9 on the USBASP? The difference seems to be that Altomcat's shows no connection between pin 8 and GND in the lens, but does show the same Pin8 and Pin9 connections when programming. There are indeed some differences between my post and Altomcat's. 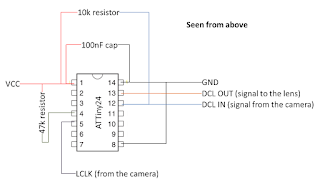 I did it a long time ago and had to look on pictures from the german forum to realise that pin 8 (of the ATTiny) had to be connected to GND when using the lens (i.e. not programming). Connecting it to GND during programming should not break anything but should prevent you from programming the chip. I hope this is correct and please let me know if the text needs updating (I don't do it now because I did this too long ago to be completely sure). It'll be next weekend before I have the time to run through the method for real for myself. I'm first trying it on a cheap 100-300 UC I bought off eBay as a test lens, before I commit to hacking my 400mm APO telemacro! (Though I suspect the test lens will be more difficult due to space restrictions). 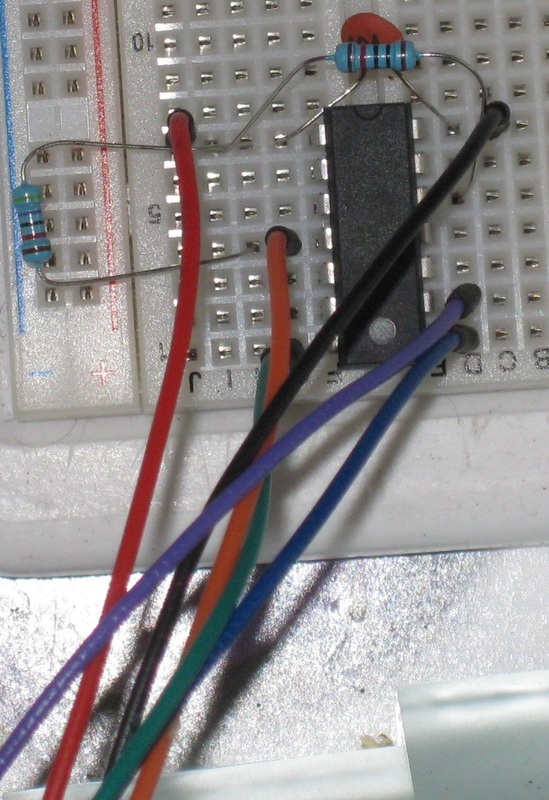 "Note: pin 9 should not be connected to GND when programming the ATTiny24 (or it won't work)." should probably refer to Pin 8 instead as this is connected to GND in the diagram. Also - many thanks for what is the definitive English language guide to restoring an old Sigma lens! When I found your page I became genuinely excited! Success! 100-300 UC was a good practice lens and my 400mm APO telemacro converted fine, the only errors I get now are occasional Err01 after around 6 continuous shots in burst mode (firmware v2). Pin 8 to GND in the lens clearly works, or at least doesn't do any harm! - It involves soldering near the rear lens element, so I protected the rear element from solder splash with adhesive backed copper tape (being careful to not actually contact the glass). I assume a couple of layers of Aluminium foil and some masking tape would do the job too. - The only suitable cable I had to hand was multi-core data cable wire, which is a pain to solder as it's stainless steel and doesn't wet well. An expert advised me to flux and pre-solder the stripped ends and the target contacts before making the final solder bond. This makes sure the solder at least penetrates the strands and gives some mechanical keying adhesion. - soldering the wires to the EOS connector before connecting them to the chip seemed easiest to me. - There's fragile looking gears and belts visible inside the APO tele lens so to avoid the chip or wires fouling on them I wrapped the chip in electrical tape and secured the it to the inside of the lens casing using a solid block of 1mm thick double sided adhesive tape, a bit like a bug with it's legs in the air. It's secure but can be prised off if needed. - Before commiting to a test with my DSLR I tried the lens on an old film body first. I figured if I'd made a mistake that was bad enough to damage a camera then I'd rather it wasn't my DSLR, and old film bodies are cheap on eBay. Thanks JV, I added your tips to my post, I'm sure other readers will find it useful !